Friendship Day is a day for celebrating friendship. The day has been celebrated in several southern South American countries for many years, particularly in Paraguay, where the first World Friendship Day International Friendship Day was proposed in 1958. Friendship Day celebrations occur on different dates in different countries. 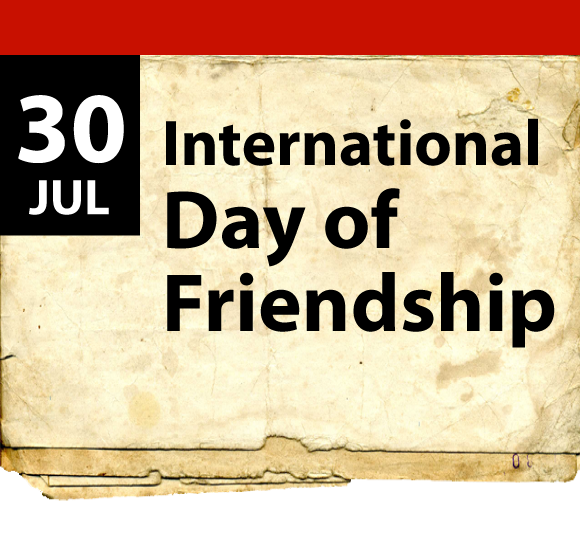 The first World Friendship Day was proposed for 30 July in 1958, by the World Friendship Crusade. On 27 April 2011 the General Assembly of the United Nations declared 30 July as official International Friendship Day. However, some countries, including India,]celebrate Friendship Day on the first Sunday of August. In Oberlin, Ohio, Friendship Day is celebrated on 8 April each year. Initially created by the greeting card industry, evidence from social networking sites shows a revival of interest in the holiday that may have grown with the spread of the Internet, particularly in India, Bangladesh, and Malaysia. Digital communication modes such as the Internet and mobile phones may be helping to popularize the custom, since greeting friends en masse is now easier than before. Those who promote the holiday in South Asia attribute the tradition of dedicating a day in honor of friends to have originated in the U.S. in 1935, but it actually dates from 1919. The exchange of Friendship Day gifts like flowers, cards and wrist bands is a popular tradition of this occasion. The International Day of Friendship was proclaimed in 2011 by the UN General Assembly with the idea that friendship between peoples, countries, cultures and individuals can inspire peace efforts and build bridges between communities. The resolution (A/RES/65/275) places particular emphasis on involving young people, as future leaders, in community activities that include different cultures and promote international understanding and respect for diversity. The Day is also intended to support the goals and objectives of the Declaration and Programme of Action on a Culture of Peace and the International Decade for a Culture of Peace and Non-Violence for the Children of the World (2001-2010). To mark the International Day of Friendship the UN encourages governments, international organizations and civil society groups to hold events, activities and initiatives that contribute to the efforts of the international community towards promoting a dialogue among civilizations, solidarity, mutual understanding and reconciliation. Friendship Day was originally promoted by Joyce Hall, the founder of Hallmark cards in 1930, intended to be 2 August and a day when people celebrated their friendships by sending cards. Friendship Day was promoted by the greeting card National Association during the 1920s but met with consumer resistance, given that it was too obviously a commercial gimmick to promote greetings cards. By the 1940s the number of Friendship Day cards available in the US had dwindled and the holiday largely died out there. There is no evidence to date for its uptake in Europe; however, it has been kept alive and revitalised in Asia, where several countries have adopted it. Some friends acknowledge each other with exchanges of gifts and cards on this day. Friendship bands are very popular in India, Nepal, Bangladesh and parts of South America. With the advent of social networking sites, Friendship Day is also being celebrated online. The commercialization of the Friendship Day celebrations has led to some dismissing it as a “marketing gimmick”. But nowadays it is celebrated on the first Sunday of August rather than 30 July. However, on 27 July 2011 the 65th Session of the United Nations General Assembly declared 30 July as “International Day of Friendship”.The idea of a World Friendship Day was first proposed on 20 July 1958 by Dr. Ramon Artemio Bracho during a dinner with friends in Puerto Pinasco, a town on the River Paraguay about 200 miles north of Asuncion, Paraguay. Out of this humble meeting of friends, the World Friendship Crusade was born. The World Friendship Crusade is a foundation that promotes friendship and fellowship among all human beings, regardless of race, color or religion. Since then, 30 July has been faithfully celebrated as Friendship Day in Paraguay every year and has also been adopted by several other countries. The World Friendship Crusade has lobbied the United Nations for many years to recognise 30 July as World Friendship Day and finally on 20 May, General Assembly of the United Nations decided to designate 30 July as the International Day of Friendship; and to invite all Member States to observe the International Day of Friendship in accordance with the culture and customs of their local, national and regional communities, including through education and public awareness-raising activities.